Review Summary: Talvar is gritty, meaningful cinema. Meghana Gulzar gives us one of the best films of the year! The masala loving audience might shy away from this movie, but everyone who loves good cinema will cherish this film for years to come. It's said that a pen is mightier than the sword, but in case of this 'Talwar' it's the crime thriller which is mightier than a sword. No matter which of the faces of truth the audience takes away from the film, its importance as a mirror of our times is unlikely to diminish in any way. Talvar is a must watch. The film has an engaging plot and is backed with superb performances. If you are planning to catch a film during this long weekend then Talvar should be your first choice. 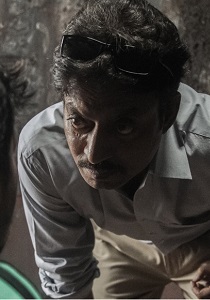 TALVAR is not breakthrough cinema. Neither is it exciting or informative. In the thinly disguised version of Aarushi Talwar and Hemraj murders, Meghna Gulzar's film shows a cracked mirror to our suburbia. Konkona Sen Sharma and Irrfan Khan’s movie will keep you hooked! Unnerving, unsettling and gripping—this Irrfan Khan starrer is a must watch! This Irrfan Khan and Konkana Sen Sharma thriller is dreadfully ENGAGING! Aarushi Talwar double murder case was one of the most talked-about and followed cases in recent times, both in the media and the public.